As of January 31, 2018, the Washtenaw County region has had a slightly above average amount of snowfall. The Washtenaw County Road Commission uses somewhere between 14-20 tons of salt in an average year. The cost of salt for Washtenaw County this winter is $31 - $76 per ton, through the MIDEAL government contract. A salt shortage like that of 2013-14 is not anticipated. New research that examined 371 lakes, including some in Michigan, found that 44% are at risk of long-term salinization. Applying these results, approximately 12% of lakes are likely to become brackish by 2050. The salinity of the Huron River Watershed is tested annually, and, currently, it is below a limit of concern. Salt use for deicing has skyrocketed in the past 50 years. The EPA estimates that 22 million tons of salt is applied to roads annually. That salt is increasingly washed into lakes, rivers, and streams, in part due to a vast increase in the amount of impervious surface and developments that encroach on the edges of water bodies. Road salt has a number of environmentally destructive effects on water quality, soil, wildlife, and public health. If extreme winter weather conditions become the norm, these effects could escalate. The health of the Huron River Watershed is carefully monitored for contaminants, including salt, and steps are taken to modify water when chloride levels are unacceptable. High chloride levels (eight times the norm) were partially to blame for the corrosion that occurred during the Flint water crisis. Ric Lawson, Watershed Planner for the Huron River Watershed Council, implements watershed plans in Washtenaw County and monitors water quality for salt and other sediments in our waterways. The HRWC offers recommendations for decreasing salt use. In a new study, researchers show that across the United States and Canada, thousands of lakes are at risk of becoming dangerously saline. In their study cataloguing the salinity levels of 371 lakes across northeastern Canada and the United States, researchers found that 44 percent of the lakes are at risk of long-term salinization. Extrapolating their observations, they suspect that as many as 7,770 North American lakes could be similarly threatened. If nothing changes, 12 percent of lakes will turn brackish by 2050 says Samantha Burke, a doctoral candidate at the University of Waterloo in Ontario who worked on the study. * In the same period, Burke and her colleagues expect 14 of the 371 studied lakes to hit salinity levels that exceed the threshold for aquatic life, a bar set by the US Environmental Protection Agency. The concentration of salt in freshwater lakes typically sits anywhere from zero to 100 milligrams per liter. (Seawater, by comparison, is usually about 35 grams per liter.) But even slightly salty water—anything over 100 milligrams per liter—can have harsh effects on freshwater ecosystems. Salt water disrupts lake circulation, which in turn affects oxygen levels and aquatic life, says Sujay Kaushal, a geologist at the University of Maryland who was not involved in the study. “If you go along roads where they salt, all the trees are brown,” Kaushal says. “All of the water in the tree moves toward the salt, drying out the plant.” The same thing often happens to organisms in fresh water. Cattails and other plants that grow on a lake’s edge don’t like salty water, Kaushal says. Neither do many native freshwater fish and amphibians, some of which suffer reproductive problems when exposed to high levels. Even eels and salmon, animals that spend different parts of their lives in salt or freshwater, don’t survive in fresh water that is overly salty. Where freshwater species flounder, salt-tolerant species flourish. On the East Coast, the common reed has already encroached on certain lakes. Disease-bearing mosquitos such as the yellow fever mosquito, thrive in the brackish waters that kill off competing mosquitos and potential predators. Conditions become ripe for blue-green algae and cyanobacteria, which can fuel low-oxygen dead zones, choking the lake. The worst-case scenario is a lake where the surface is an algal mass, mosquitos swarm above the reeds, and the native food web has collapsed. Road salt is a major threat to freshwater lakes. Over the past 50 years, annual US sales of road salt have shot from 145,000 tonnes to around 18 million tonnes. [EPA says 22 tons.] But Burke says another major contributor is the prevalence of impermeable surfaces, such as roads and parking lots, that are within 500 meters of a lake. A little bit of development near a lake can make a big difference in salinity levels. “Even one percent coverage [with] an impervious surface inside that buffer—like a highway—can have serious effects,” Burke says. It’s hard to get road salt out of the environment, says Kathleen Weathers, an ecologist with the Cary Institute of Ecosystem Studies in Millbrook, New York, who participated in the research. Even salt banked in the soil eventually weathers and ends up in lakes decades later. As it stands, freshwater lakes are faced with an existential threat. If the concentration of salt in the environment continues to increase, it’s a threat that will be difficult to curtail. North America's freshwater lakes are getting saltier due to development and exposure to road salt. A study of 371 lakes published in the Proceedings of the National Academy of Sciences reports that many Midwestern and Northeastern lakes are experiencing increasing chloride trends, with some 44% of lakes sampled in these regions undergoing long-term salinization. The study is the first large-scale analysis of chloride trends in freshwater lakes. It was conducted by a team of fifteen researchers as part of the Global Lake Ecological Observatory Network (GLEON) Fellowship Program, an initiative that seeks to train the next generation of freshwater scientists and practitioners. Lead author Hilary Dugan, a limnologist at the University of Wisconsin-Madison and former Cary Institute of Ecosystem Studies Postdoctoral Fellow, explains, "We compiled long-term data, and compared chloride concentrations in North American lakes and reservoirs to climate and land use patterns, with the goal of revealing whether, how, and why salinization is changing across broad geographic scales. The picture is sobering. For lakes, small amounts of shoreline development translate into big salinization risks." Chloride trends in 371 freshwater lakes were analyzed. Each lake was larger than 4 hectares in size with at least 10 years of recorded chloride data. The majority of the lakes (284) were located in a North American Lakes Region that includes Connecticut, Maine, Massachusetts, Michigan, Minnesota, New Hampshire, New York, Ontario, Rhode Island, Vermont, and Wisconsin. Since the 1940s, the use of road salt to keep winter roads navigable has been escalating. Each year, some 23 million metric tons of sodium chloride-based deicer is applied to North America's roads to melt away snow and ice. Much of this road salt washes into nearby water bodies, where it is recognized as a major source of chloride pollution to groundwater, streams, rivers, and lakes. To gauge road salt exposure, the research team assessed road density and land cover within a 100- to 1500-meter buffer around each of the 371 study lakes. Roadways and impervious surfaces such as parking lots and sidewalks are reliable proxies for road salt application because as developed areas, they are susceptible to high levels of salting and runoff. Results were clear: roads and other impervious surfaces within 500 meters of a lake's shoreline were a strong predictor of elevated chloride concentrations. In the North American Lakes Region, 70% (94 out of 134) of lakes with more than 1% impervious land cover in their 500-meter buffer zone had increasing chloride trends. When results are extrapolated to all lakes in the North American Lakes Region, some 7,770 lakes may be at risk of rising salinity. If current salinization trends continue, many North American lakes will surpass EPA-recommended chloride levels in 50 years. Within this study, 14 North American Lakes Region lakes are expected to exceed the EPA's aquatic life criterion concentration of 230 mg/L by 2050, and 47 are on track to reach chloride concentrations of 100 mg/L during the same time period. Co-author Sarah Bartlett, a graduate student at the University of Wisconsin-Milwaukee, explains, "These results are likely an underestimation of the salinization problem, as a number of regions with heavy road salt application, such as Quebec or the Maritime Provinces of Canada, had no long-term lake data available." Co-author Flora Krivak-Tetley, a graduate student at Dartmouth College, added, "It is also extremely difficult to obtain rates of road salt application both through time and across regions. Better application data would allow us to more accurately forecast ecosystem health." In lakes, elevated chloride levels have been shown to alter the composition of fish, invertebrates, and the plankton that form the base of the aquatic food web. Aquatic species richness and abundance can decline, and in extreme cases salinization can prevent lakes from mixing -- causing low oxygen conditions that smother aquatic life and reduce water quality. The study's authors recommend that best lake management practices recognize that shoreline management extends well beyond a lake's perimeter. While many states and municipalities acknowledge the importance of shoreline management, they note that zoning regulations are often only enforced within 300 meters, and many lakes lack the monitoring programs needed to adequately track lake health. Coauthor and Fellowship advisor Kathleen Weathers, an ecosystem scientist at the Cary Institute of Ecosystem Studies and co-chair of GLEON, comments, "In the North American Lakes Region -- where road salt is a reality -- roads and other impervious surfaces within 500 meters of a lake's shoreline are a recipe for salinization. We need to manage and monitor lakes to ensure they are kept 'fresh' and protect the myriad of services they provide, from fisheries and recreation to drinking water supplies." A lake's chloride status may also provide a window into the ecological health of its watershed. Co-author Samantha Burke, a graduate student at the University of Waterloo, adds, "Unlike flowing streams and rivers, water resides in lakes for long periods of time. This makes them vulnerable to pollution from their watersheds and good early warning indicators of environmental disruption." In Michigan, of course, we use a lot of road salt in the winter. Mark Geib is the engineer of operations for the Michigan Department of Transportation. “Really our top goal is the safety of the motoring public. So with that in mind, of course, is a reality of being prudent in how we do a lot of what we do, including the usage of salt,” he says. He says pollution from salt is a big concern. He says they do several things to use no more salt than they need. That includes using special spreaders, driving trucks more slowly so more salt stays on the road, and pre-wetting salt with a brine. “It makes it so when we dispense it onto the roadway, it doesn’t bounce as much and sticks to the pavement. And also we try to drop it right where it's actually needed on the pavement, so it's getting it right where it needs to be, and so ultimately then you can use a little bit less," he says. Geib says the brine treatment also helps the salt do its job of de-icing faster, so it's also better for safety reasons. — Bounce and scatter study. Completed a few years ago and as a result, MDOT engineers determined that driving slower (25 MPH range) when salting keeps almost all the salt on the road (no waste). So an operator drives slower when it can be safely done, and that conserves salt. — Innovative, more efficient equipment such as zero-velocity spreaders and salt-slurry spreaders that conserve salt and keep more on the road. — Development of a Maintenance Decision Support System (MDSS), which includes using sensor and weather data to provide real-time information to plow operators as to the best rates and proper amounts of salt to put down depending on pavement and weather conditions. This increases efficiency and service levels while reducing salt usage. — Pre-wetting salt with brine solutions so more salt stays on the road where needed and activates more quickly. — When appropriate, anti-icing ahead of storms when conditions are right to then ultimately have less need for anti-icing later and after a storm. — Interaction with other state DOTs, AASHTO and organizations like Clear Roads to share best practices and innovations and exchange new methods and materials. — On-going training for our plow truck drivers in both sound practices and the environmental effects of salt so they understand the importance of using salt judiciously. MDOT's Mark Geib says there are good alternatives to road salt but they’re more expensive. He says in Michigan, we already spend around $25 million a year just on salt. The amount of salt use in Washtenaw County varies depending on the severity of winter conditions. [I could not find salt estimates for 2017-18.] The Washtenaw County Road Commission used approximately 22,000 tons of salt during the 2013-14 winter season, nearly double what was used in 2011-12. (Courtesy Washtenaw County Road Commission.) About 35 percent of that was paid for by the Michigan Department of Transportation for use on state trunkline highways, the remainder was used on roads and highways throughout the county. During more extreme winters, such as the 2013-2014 and 2007-2008 seasons, the city of Ann Arbor used about 8 tons of salt on its roads. Ann Arbor’s snow plow equipment uses “electronically calibrated spreader controls” to keep the amount of salt used to the minimum amount that is still consistent with traffic safety. The price the city is pays for salt is established through a state of Michigan’s MIDEAL program. [This year, salt cost $31 - $76 per ton. 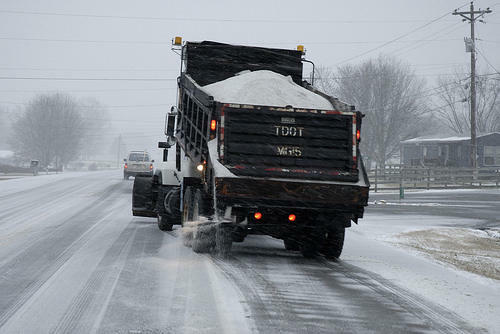 Municipalities forecast the amount of salt they think will be needed in a given winter. If their estimates are low, sometimes they must buy more salt on the open market.] In 2014, purchasing additional material on the open market would be about $140, or nearly four times as much as under the MIDEAL program. HRWC RECOMMENDS SHOVELING EARLY AND OFTEN. AVOID USING SALT AND OTHER DE-ICERS ALTOGETHER! Balance your need for safety, potential environmental impacts, costs and convenience when choosing the best snow removal option for your home. Do consider a product that is labeled “environmentally or eco friendly,” keeping in mind that most contain some chloride. Shop early in the season for more choices in the store. Check and follow the label’s application instructions for the most effective treatment. Some work better when applied before a snowfall to prevent ice from forming. Some stop working at colder temperatures. Pay attention to whether directions refer to air or pavement temperatures. Limit your use of sand. Instead of melting ice, sand provides traction. But it also increases the amount of sediment in our lakes, rivers and streams. Promptly remove slush and any residual de-icers or sand from concrete surfaces to minimize polluted runoff. If de-icer or sand is visible on dry pavement it is no longer doing any work and will be washed away. Sweep it up and save it for later or throw it away. Ric Lawson, Watershed Planner for the Huron River Watershed Council, joined HRWC staff in 2006, but has been volunteering for HRWC since 1999. He is primarily responsible for coordinating the development and implementation of several watershed management plans in the upper, middle and lower sections of the watershed. He also runs the Water Quality Monitoring Program across the watershed, and is facilitating Green Infrastructure planning for stormwater. Ric earned joint Masters Degrees in Environmental Management and Public Policy at Duke University. Governor Rick Snyder wants to increase the cost of dumping waste in the state’s landfills. This is part of the governor’s proposal to improve Michigan’s environment. Cheyna Roth reports on Gov. Snyder's plan to increase the cost of using Michigan's landfills. Governor Rick Snyder gave his last State of the State address on Tuesday night, and Michigan League of Conservation Voters executive director Lisa Wozniak gave it her full attention. Wozniak spoke to WEMU's David Fair about the environmental factors--or lack thereof--of the governor's speech. The new year brings a number of environmental challenges in Michigan. Governor Rick Snyder is in his lame duck year, and mid-term elections could impact legislative priorities. In this month's edition of "1st Friday Focus on the Environment," you'll get a sense of where we're headed. 89.1 WEMU's David Fair and executive director of the Michigan League of Conservation Voters, Lisa Wozniak look ahead at what 2018 holds for environmental policy and action in 2018. Joining the conversation is Maggie Pallone, vice president of Public Sector Consultants' Environment and Energy practice.